summer of salads!! i mean, that's what you're supposed to eat in the summer, right? think light. anyway, there's a new girl in town. and let me tell you, she's a beaut ... blue door farm stand in lincoln park has been one of my go-to shops for salads this summer for a few reasons. 1. i love the walk from lakeview to lincoln park. great people watching, nice distance, the perfect lil amount of casual exercise. 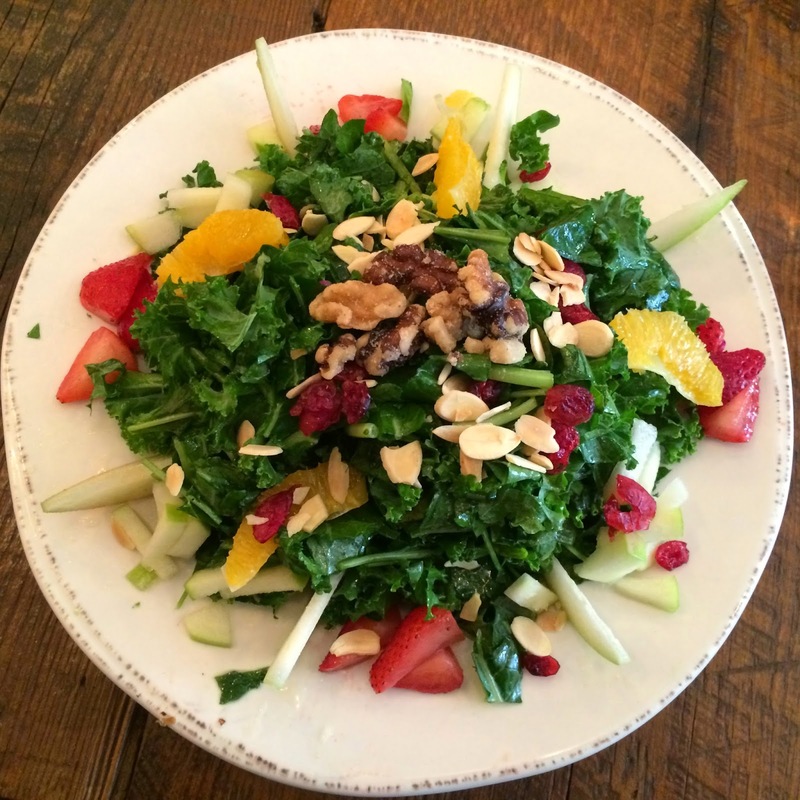 2. the citrus & kale salad is the shiz. jumping the gun a little bit. first, a few words about this place : "the café features fresh, seasonal food & drink from local farms & farmers' markets ... our philosophy at blue door farm stand is simple. we believe in the seasons dictating what's on the table." check & mate. orange segments, pears, apples, strawberries, walnuts, almonds, cranberries & apple cider vinaigrette. no bleu cheese. i've said this before & i'll say it again, i usually am not into nuts on my salad. but just as beatrix & crosby's kitchen changed my opinion about fruit (dried or otherwise) on my salads, blue door has officially changed my stance on nuts. (haha, laugh it up.) this is a fresh, beautiful salad & you simply cannot ask for anything more. between now & whenever our typical chicago sub zero weather rolls around, i approximate that i'll walk to blue door 3-4 more times. see ya there?